Blogger and fan of the Internet and social networks. Co-founder and editor of the Zenica-Online magazine. Believes that essence is much more important then shape. She also believes that only knowledge and constant improvement of ourselves can take us forward and that the key-ingrediant of every person’s success is “I can do it” attitude. Darko is one of the founders of NewMediaMK – Internet marketing agency and the non profit New Media Center. Actively started to work in the new media field 6 years ago as blogger and continued as lecturer, trainer and consultant. He has been part of the organizational team behind the Glocal Conference and many other local and regional new and social media related events. As a freelancer as well as CEO of NewMediaMK he has worked with many different local, regional and global brands such as KitKat, IDEA, Domitalia, Global Media Publishing, Seavus etc. As speaker and/or official blogger he participated on LeWeb, World BLogging Forum, BlogOpen, Social Media Day Skopje, eSociety and many new media related events. 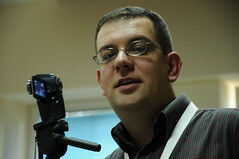 He is founder and one of the co-authors of the blog network komunikacii.net focused on media, new media, online marketing and mobile communication. Marcus Agar is a British journalist and international PR consultant. He writes extensively about contemporary culture in Serbia and the Western Balkans for his popular blog Wild Rooster, produces a weekly column in Serbia’s award-winning Wannabe Magazine and is regularly featured in Britić (British Serb magazine) and the USA Serbs Network. He also contributes to Branding Magazine. Marcus has worked extensively in consumer and entertainment PR. He is as comfortable directing communications for personalities and global brands as he is working with SMEs and international NGOs. Marcus travels extensively and has explored the Balkan region widely in recent years. He has a passion for film, music and good books, and enjoys few things more than great food with a good bottle of wine among friends. Unexpected entry into the world of online media back in 2003, lunched Boris in roadless internet area in which he still swims. Little more than five years ago he started at Gadgeterija.net blog about gadgets and different internet bizarre occurrences where he spends most of his time. At the same time he „throws“himself into the water of community management, where has been successfully practiced in the social profile pages tportal.hr Croatian Telecom. You can find Boris at Twitter, Facebook, Facebook fan page Gadgeterija, Twitter profile Gadgeterija, but his greatest love are located in offline world. Five month old Stela (btw. youngest participator on the BlogOpen in 2010.) and 436-monthly old Zlatka occupy most of his time what make him extremely proud.